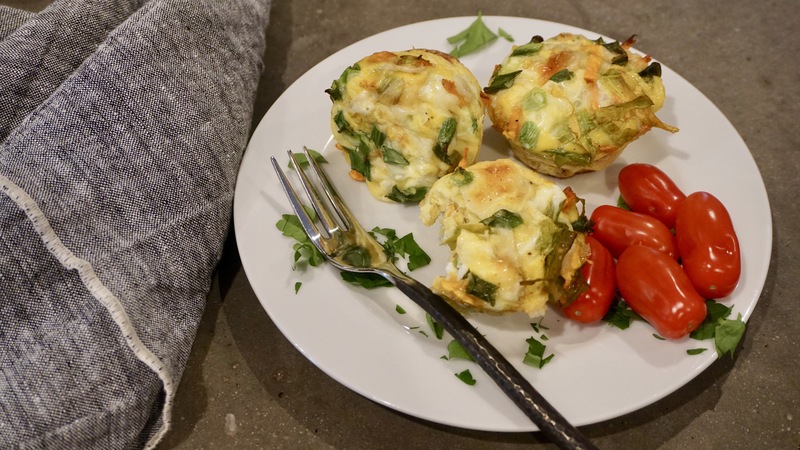 While I am a big fan of a frittata, these egg muffins are great for weekly batch cooking and super easy for a grab and go breakfast. They also pack a punch nutritionally as well. The original recipe came from Danielle Walker’s cookbook, “Eat What You Love”, but of course I have tweaked it using ingredients that I love. 1. Preheat oven to 350. Place greased muffin tin on rimmed cookie sheet. (I find the silicone muffin cups work best. If you don’t have any of those you can use paper muffin cups). 2. In a large bowl beat eggs with milk, salt and pepper. 3. In a separate bowl, combine green onion, cheese, kale, sweet potato, bacon, chives, parsley and thyme. 4. Fill muffin cups with bacon mixture and push down to leave plenty of room for the egg mixture. 5. Pour egg mixture over the top of bacon mixture, filling the cups ⅔ full. 6. Bake for 20 minutes or until a toothpick inserted in center of muffin comes out clean. 7. Allow muffins to cool in pan for about 20 minutes then release onto a baking rack. These muffins can easily be frozen if you desire to make a double batch. They are very easy to reheat on a cookie sheet in the oven or toaster oven. Preheat oven to 350. Place greased muffin tin on rimmed cookie sheet. (I find the silicone muffin cups work best. If you don’t have any of those you can use paper muffin cups). In a large bowl beat eggs with milk, salt and pepper. 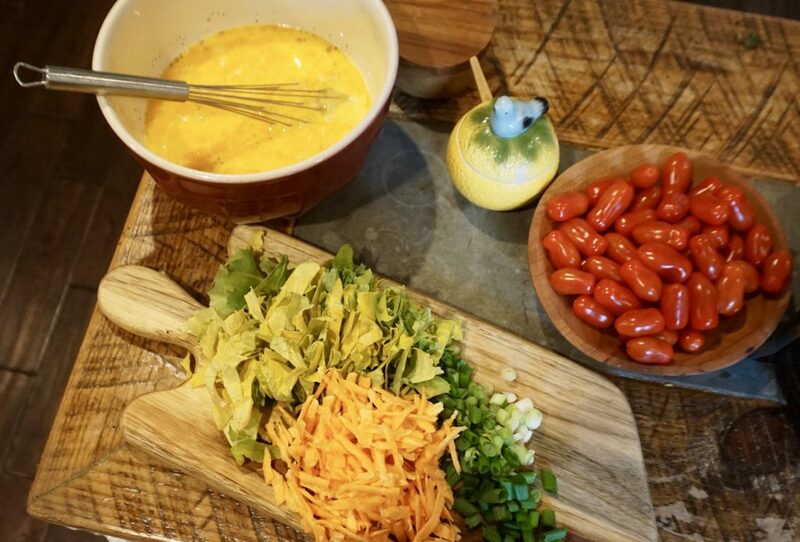 In a separate bowl, combine green onion, cheese, kale, sweet potato, bacon, chives, parsley and thyme. Fill muffin cups with bacon mixture and push down to leave plenty of room for the egg mixture. Pour egg mixture over the top of bacon mixture, filling the cups ⅔ full. Bake for 20 minutes or until a toothpick inserted in center of muffin comes out clean. Allow muffins to cool in pan for about 20 minutes then release onto a baking rack. These muffins can easily be frozen if you desire to make a double batch. They are very easy to reheat on a cookie sheet in the oven or toaster oven.